Our editor and FLM.com owner, and Long Island On The Fly guide, Captain Andrew Derr with a nice striper taken on the “flats.” Photo B. McCarthy. Every species of game fish will react to a witnessed fly. If the fly and presentation don’t spook it, how it is retrieved will be the next decider. To the fish, the presentation is either an opportunity to eat or a dangerous situation in which it gets consumed. Fish don’t have alternate realities like presidents and cable news bloviators. It’s just reality, eat or be eaten… flight or found protein. If it’s a crab and swims darting on the surface its all bets off, think no bite, ever. Another example, if you swim a Lefty’s Deceiver fly “AT” a 200-pound tarpon, it will take flight. Only the modus operandi that tarpon has encountered for millions of years gets an eat response. A wildly fast, attacking and unnatural swim retrieve would spook that tarpon, EVERYTIME. Captain Duane Baker’s crab fly travels well. It’s a big bone attractor and out-fishes in the Keys, Biscayne Bay, Bahamas, Belize, and Los Roques. Photo probably by Pat Ford? So, that beautifully tied sand eel fly Aunt Jane gave you hasn’t got a chance of catching that striper if you can’t swim it correctly. However, there are plenty of latitudes with flies. Take for instance Lefty Kreh’s Deceiver, Bob Clouser’s Deep Minnow, Charlie Smith’s Crazy Charlie, Russell Blessing’s Woolly Bugger, or Jack Gartside’s Gurgler. You can argue with your mates until the bar closes about what each of those flies is supposed to be and never agree that it doesn’t look like anything. But what they each do is catch fish – fish will go after it if it looks like something familiar on the menu in their neighborhood and you’ve swum it plausibly. A tournament angler I know, Tim Mahaffey, has more Florida Keys bonefish wins notched in his belt than anyone. So, he’s fanatical about tying flies, right? Nope. Flies — Years ago noted fly tier Tim Borski looked into my fly box during a Redbone Tournament and was shocked. I guess he expected some elaborate selection. I remember Tim asking me, “That’s it?” I think that might have been an insult, but if you ever look into his beautiful box of creations, I know you would understand. Tim’s swim is how it works. You fish with Tim, make the same great cast with the same fly to a similarly positioned bonefish on the same day, same hour, same place – Mahaffey’s eats and your bone carries on bonefish business for the day. What went wrong? YOU DIDN’T SWIM THAT FLY PERFECTLY. I know, I was there. 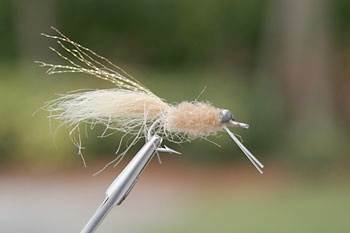 There are so many theories about tying flies, especially trout flies. It’s almost like believing in Sasquatch. When it comes to tournament fly fishing, which is almost exclusively in Europe for freshwater trouts, the rigging, and the fly are all designed so the “baits” (fly – flies in nymphing) can swim a certain way, not the other way around. There is no attempt here to cover up my inadequacies as a fly tyer and lay it off as only swimming a fly correctly catches fish. Every tyer tries his or her best to put together the best Adams, best mouse, best shrimp, best whatever – it’s just bred into all of us to do our best. Some folks are just superior at tying. No matter your skill level or purchasing power, the fly still needs to be adequately presented, swum correctly and discovered in the appropriate water column within the water temperature parameters established thousands of years ago. It’s that simple, stupid.